Cardamom is a spice made from the seeds of several plants in the genera Elettaria and Amomum in the family Zingiberaceae. The Zingiberaceae family is a highly aromatic family of plants, with most being prized for their exotic spicy aromas and tastes. Cardamom is a close relative to ginger. Both genera of cardamom are native to India. They are recognized by their small seed pods, triangular in cross-section and spindle-shaped, with a thin, papery outer shell and small black seeds. Cardamom is the world's third-most expensive spice, surpassed in price per ounce only by vanilla and saffron. Cardamom is widely used as a flavoring and spicy ingredient in curries, candy products and herbal digestive aids. Cardamom essential oil has aromatherapy potential in skincare products and can often be found blended with other essential oils. The major components present in cardamom essential oils are α-terpinyl acetate, 1,8-cineole, and linalool. Cardamom has warm, sweet, spicy top notes with woody, balsamic undertones. It blends well with most other spices, citruses and florals, as well as with frankincense, sandalwood, vetiver, patchouli, cedar wood and rosewood . Studies on the shelf life of carbon dioxide extracted cardamom oil (Cardamom CO2) compared to steam-distilled cardamom essential oil showed that although the initial fragrance profile obtained via CO2 extraction was preferable for use in flavor and fragrance applications, there was a marked decrease in volatile oils within 45-90 days of extraction. This suggests that stability is an issue when extracted via carbon dioxide and should be taken into consideration in formulation . In a study on the antioxidant activities of cardamom, it was determined that the essential oil and oleoresins were comparable to the synthetic antioxidants butylated hydroxyanisole (BHA) and butylated hydroxytoluene (BHT) at 0.02% concentration. Furthermore, the same study indicated that cardamom essential oil exhibited strong antibacterial activity against the micro-organisms Staphylococcus aureus, Bacillus cereus, Escherichia coli and Salmonella typhi . Although topical usage of cardamom plant material does not appear to have been studied in depth, there are numerous studies referring to internal use of cardamom as it has traditionally been used for its aphrodisiac, digestive, carminative and flavoring properties. Cardamom is one of several “warming” spices used in the popular beverage, chai tea. One study did find potential for cardamom as a chemo-preventive agent against two-stage skin cancer. However, these studies used oral doses of cardamom in suspension rather than topical application of the actual spice . 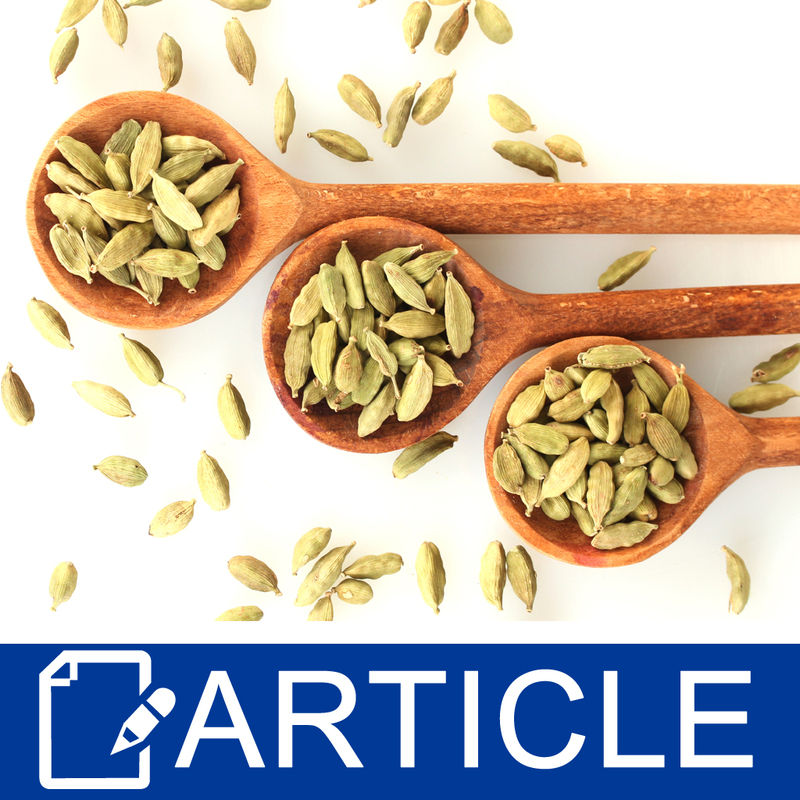 Contact and systemic contact-type dermatitis reactions to cardamom have been reported and confirmed by patch testing [5,6]. In spice factory workers with a history of skin symptoms, irritant patch test reactions were observed for cardamom in some workers . As with any raw material that shows any level of sensitivity, caution should be exercised when adding cardamom to skincare preparations. In particular, preparations intended to be used as a “leave on” product such as lotions, deodorants or perfumes. Usage rates for Cardamom Essential Oil hover somewhere below 0.6% of formulation depending on the products intended use . Experts have indicated that due to its 1,8 cineole content, Cardamom Essential Oil may cause central nervous system (CNS) and breathing problems in young children. They caution against using Cardamom Oil on or near the face of infants and children . In conclusion, cardamom should be used in skincare products with some caution. Good manufacturing practices suggest that cardamom should not be included in products targeted towards children, usage rates should be kept low to avoid sensitization and products should indicate the presence of a potential allergen with a warning to discontinue use if a reaction were to occur. Qiblawi S, Al-Hazimi A, Al-Mogbel M, Hossain A, Bagchi D. Chemopreventive effects of cardamom (Elettaria cardamomum L.) on chemically induced skin carcinogenesis in Swiss albino mice. J Med Food. 2012 Jun;15(6):576-80. doi: 10.1089/jmf.2011.0266. Epub 2012 Mar 9. PubMed PMID: 22404574. Dooms-Goosens, A., R. Dubelloy, and H. Degreef. 1990 Contact and systemic contact-type dermatitis to spices. Dermatol. Clin. 8(1):89-93. Mobacken, H., and S. Fregert. 1975. Allergic contact dermatitis from cardamom. Contact Dermat. 1(3):175-176. Tisserand, R.,Young, R.. Essential Oil Safety (Second Edition. United Kingdom: Churchill Livingstone Elsevier, 2014), p232.